Since my current work-in-progress deals with nightmares it seems not only appropriate but necessary to frighten myself in some way in order to properly convey that feeling to the reader. Be it from a movie, book or my own dreams, I need to feel the same degree of terror as the main character. The story won't feel complete if I can't accurately convey the emotions involved. The problem lies in that I can't remember the last time I felt that degree of fear & dread. I've read about it countless times but so rarely does the work in question fill me with the same emotion. My blasted rational human mind quickly filters Real-World™ input so even my involuntary emotional reactions are muted to a degree & anything less than pure threat of Real-World™ danger will be less than sufficient for the desired effect. Needless to say, I won't feel comfortable if I continue to write without knowing at least a modicum of the fear that my poor protagonist will survive. matt_william & I have had a number of discussions of horror movies &, tho' our preferences toward such greatly differ I believe he would be a great help in finding what might work for me. As I recall, the last movie that gave me nightmares was The Blair Witch Project, not so much for the specific content of the movie but what its suggestions did to my unconsciousness mind. Not since then have I really lost sleep due to a movie. It's easy enough to get the creeps from some films in the right atmosphere & on occasion even the jibblies, but still not the effect I'm looking for. As local movie experts I will be consulting Messrs matt_william & sacredspud on this matter for advice but I welcome film & book suggestions any might have. Works that grip the intellect rather than the senses are preferred. The work must be able to instill actual fear and/or terror in the viewer/reader. Preferably of such that lasts long after the story is over. Story is the key to a good scare. If it can't draw you in it won't be scary for more than a few moments, if at all. Cheap scares do not count. These include quiet moments shattered by a sudden chord of dramatic music or something suddenly flung at the camera. This is merely startling the viewer/reader. Blood & gore can have their place in a good horror story but if it merely instills shock and/or revulsion it won't. All this talk of movies has made me momently forget video games. I have indeed found myself in genuine terror when playing the new game Call of Cthulhu: Dark Corners of the Earth. Phill can attest to one day in particular when he heard me cry out & rushed in to find the source of my outburst. I showed him & he reacted in same. In point, since I have been neglecting this game these past two weeks I will remember to devote more time to it in genuine research. Speaking of nightmares, I've had a few of my own over the past several days. In one I met Carl Palmer of ELP. In another I raced to fully develop a story in my head before awakening so I could write it, which of course I forgot most of by the time I did & the rest of later that day. The dream holding the most of my interest was late last week when I survived a zombie holocaust. I don't just mean holding up in an abandoned house until it all blew over. I was out there in the night fleeing the suckers when I wasn't fighting back, as well as avoiding mortars & gunshots form human soldiers combating the onslaught of the undead & wracking my hot, juicy brain for ways of convincing them that I wasn't one of the others. By morning it was all over, in the dream world as well as real, but it's the one that stuck closest to me until this opportunity to finally record it. What I felt throughout tho' was not horror or terror. Perhaps some fear for my safety but I had more concern for staying alive & determination to not let them get the best of me. We won. I wasn't a hero but I was still a survivor. I've seen more movies than usual as of late, thanks mostly to Colin who had a couple evenings free at the end of last week & spent them with me. We watched four films inspired by the works of our friend H.P. Lovecraft. The Shunned House is a fairly new Italian film which attempts to combine "The Shunned House", "The Music of Erich Zann" & one other I can't remember because the elements were so trace. Die Monster Die is a Boris Karloff film that attempts to tell "The Colour out of Space" & only succeeds in accuracy as far as the swirling colours in the opening credits. 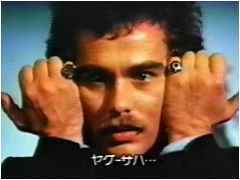 The Dunwich Horror is based on the story of the same name except it stars a young-ish Dean Stockwell as the horrible Wilbur Wheatley instead of this. The fourth film (if there is one) I can't recall but all of the above held considerable references to Lovecraft but not as such that a purist could happily appreciate. There seems to be some illness that possesses filmmakers to add unnecessary elements -- like including character names from different stories or changing a location to something less conspicuous *coughArkhamcough* -- that only work to reveal their own incompetence rather than cleverness with the source material. So rare a day it is when someone out there decides to do it right. While Colin was over Friday I received a call from my long-distance friend Anjean who was planning a trip to the city where a favourite band was playing live. I practically insisted she let me be her guide (rather than permit an outsider to wander lost through the unfamiliar streets of our capital city) & we quickly worked out a schedule where she would stop by my place Saturday afternoon, I'd drive us to the UW campus, show her where the Union Terrace was hidden & then together enjoy the first session of this semester's Anime Club until her concert began. It worked out splendidly & I only missed two of the seven series previewed. It's been a while since I've been a regular at Anime Club (the details of why are too pathetic to be posted here) so I was able to regain the excitement & newness once lost to familiarity. It had been far too long I've seen these friends or watched any great quality of anime. To quote crabmoon, I felt like a bad geek. The three series I voted for were: The Melancholy of Haruhi Suzumiya, Planetes & Samurai 7. The first of which made it. The other two we'll be watching are Noein, which unnerves me only because if I miss a showing I'm screwed because the story requires close attention, & Louie the Rune Soldier. . . the English dub. How this made it still puzzles me but you can miss a lot when you're uninvolved in club affairs for three semesters. It's a decent dub but I still prefer Japanese. I also own the series & despite only seeing half of it so far I'd like something a bit newer. Still, I know I'll enjoy two of the three showing so I'll have little reason to miss. I did make one mistake tho'. In my excitement to find a new show I liked so much I hurriedly downloaded Suzumiya Haruhi no Yuutsu to see the first episode again which I watched with #2 shortly after arriving home Sunday night. Also in that excitement I forgot that it indeed made the cut & eagerly watched all 14 episodes in the following two days. It's a very funny & bright series, exactly what I needed to keep my spirits up during two solid days of rain & I won't mind seeing it again. An interesting factor is that the episodes are shown not in the proper numbered order but in the order the main character Haruhi Suzumiya thinks they should be shown. It starts with episode 00 which should actually be 11th, then goes on to #2, #3, #5, #10, etc. This mixes things up quite a bit but it works surprisingly well. If they were shown in order not only would the story lose some of its wild & crazy fun but also some of the mystery. Like watching Memento in chronological order. Still, I did write up a proper chronology as I went & the next time I watch it on my own will follow the original timeline. Anjean enjoyed the showing & her concert but both were over by eleven & the night was still young. We marched up State Street enjoying the cows still on parade & I showed her some of my favourites. I'm quite fortunate to have photographed them when I did for many have been moved or removed since then. I treated her to Ian's macaroni & cheese pizza (I had spinach & feta) & we stopped by the Greenbush Bakery for the next morning's breakfast on the way home. It wasn't difficult to convince her to accept my hospitality & stay the night since she was far from home & we have a tendency to stay up to all hours visiting & to prolong goodbyes for several hours. I believe it was close to five AM before we both retired & it was close to noon when we were up again. We'd accomplished several things the night before on the mental list I'd made of places & activities I wanted to share when she visited & I considered a trip to House on the Rock but by the time we were awake & mobile there wouldn't have been enough time for an appropriately leisurely tour. We instead spent the afternoon visiting & playing We Love Katamari before she finally had to return home. It had been a full weekend but it wasn't over yet. Evidently there had been plans of a sort for a housewarming party at seanorange's but it was poorly advertised & canceled at the last minute. Several people were going to a wedding, depleting a majority of invites but Sean still left it open for anyone else to drop by. I did. I wasn't the first & certainly wasn't the last because as the night drew on the wedding reception ended & those who attended that came over, as well as nearly everyone else. Eventually someone demanded Sean make the curry he earlier promised & then canceled so good food & times were had by all. koriandrkitten got to share her favourite movie May & I tried out my LD of WoSaT to make sure it would work in his player. Sometimes impromptu parties are the best. I even got to save Sean's life by moving furniture out from beneath him when, due to alcohol induced happytimes, he decided to plummet from the upper story of his two-level apartment into the living room. But he survived unscathed & no one decided to sue so all is well. I'm somewhat amused by the fact that I was just getting up and leaving the house as you were finishing this entry. No, I don't know why I'm amused by this. Yea for entertaining weekends. I wish mine were as entertaining...but a wedding in Iowa, coupled with a headache that hasn't quit (yet). Yeah. At one point it occurred to me that I should stop & just finish the entry in the morning. Especially now since I woke up at about three in the afternoon. Late nights on weekend threw off sleep schedule. ... and your back, and your neck. Seriously tho', there was only about four feet between your feet & the floor before you dropped. That chair probably would have taken more damage than you. Good Gawd the long! Well, I agree. Completely.